Whether a professional is into Marketing, Communications, Public Relations, someone who writes email communication for corporate users or simply looking to hire one from the above, it is definitely a mandate for him/her to be proficient in the email communications that he/she has with clients. 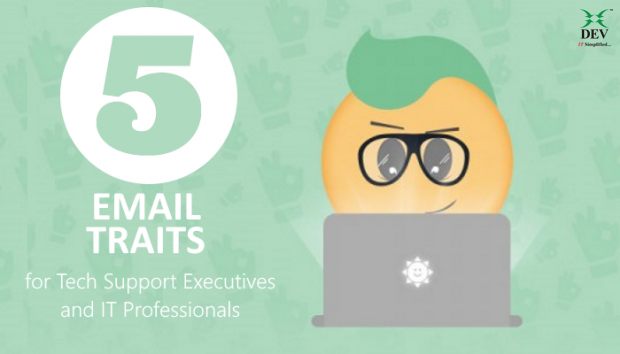 However, in today’s challenging IT support scenario, if you are an IT professional, tech support executive, system admin, into Managed IT Services delivery or a person who support system operations, you should also be aware of some common basic traits that all individuals who are heavily involved in emails, directly or in-directly, should have. Anyone communicating with a client pertaining to whether it be issues, incident, regular updates or solutions via email, should have extremely solid and detail oriented copy-writing and editing skills. Corporate emails are expected to be perfect grammatically, and when there are errors in an email it can drastically change the reader’s impression of the support quality. Email projects will typically involve both short term and long term goals and strategies. For example, acknowledging an issue raised by a client or pacifying the client, till you evaluate the root cause of the issue and resolve it, can be a short term goal. While writing an email explaining the client, the reasons of the issue occurrence and steps taken by you for issue resolution, can be a long term goal. An email professional should have the flexibility to constantly transition back and forth from writing and production, to higher level analysis of performance. Email communication techniques are constantly evolving and changing, and it takes increasingly more creative formats to reach the target audience, whether it is a confirmation email, a service initiation email or an email explaining the impacts of a scheduled downtime. Subject lines, email body, use of images and important links are all crucial elements of successful emails and a creative mind should be able to harness them in order to maximize their efficiency. Often overlooked, is the ability to follow and understand what happens after the email is written and sent. IT support professionals should have a solid understanding of how to analyse, in order to understand which emails are effective, explains the message clearly and enhance your service delivery methodologies. Using and understanding these skills, is the only way that future emails can be altered, to increase their success rate, leading to client satisfaction. As mentioned before, the IT support industry is constantly evolving. The professional involved in constant interactions with clients, through email, should have a desire and interest in keeping current with email best practices, tools and strategies. As new methods and software is developed, a company that is not staying current with email and communication trends will quickly fall behind competitors. Email is one of business’ most valuable resources today. Email communications must be implemented in the best ways possible to be effective. This takes a qualified and dedicated person who, through use of the traits above, will be able to help propel your company’s use of email to the next level. Remember! When it comes to email etiquette, it’s not as easy to control how others perceive us, and yet it’s even more important. Why? Because what you write and how you use email can affect whether your email gets read, understood clearly (in the meaning you wanted to convey), or responded to – and what that response is! Think, write and think again!